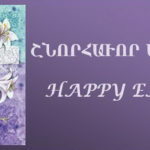 We greet you from the Holy See of Cilicia in Antelias with Christian love and fatherly blessing, and we pray that 2012 will be a year of spiritual growth and renewal, arising from the Christian values and traditions transmitted to us by our church. We also pray that it will be a year of accomplishments, as we seek justice and peace. In fact, the Armenian printed book has accompanied our people at all times, deepened its spiritual growth, enriched its cultural values and strengthened its resistance to all efforts to distort our identity and destroy our community life. I am sure that our people will associate themselves with this important event and, through the Armenian book, focus on the essential issues and challenges touching the life of our church and nation. In order to appreciate the significant achievements made in the area of printed books, we should become acquainted with the history of the Armenian printing press. Historically, printing technology began in China around the 11th Century with woodcuts stamped on leather or other materials. This primitive technology arrived in Europe during the 15th Century. According to Nicholas Milescu, Europe’s first Ambassador to China, a certain Armenian traveler named Anton played an instrumental role in the invention of the typographic technology by Gutenberg in 1439. By 1512, the Armenians were using the Gutenberg technology and around this time the first Armenian carving of letters and miniatures on metal moulds appeared. It is important to note that Armenian block books were compiled at the same time as Hebrew and Arabic. 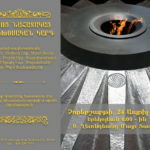 The publishing work begun with Hagop Meghabart, Apkar Tokhatetsi, Apkar son of Sultanshah, Hovhannes Derzntsi, Voskan Yerevantsi and Khatchadour Kesaratsi. The Armenian prayer book, “Ourpatakirk” (“Book of Friday”), was published by Hagop Meghabard in 1512 in Venice. This publication was innovative because it was the first to incorporate red and black inks. The second book to be published in Armenian was the Bible. The printing of the Bible and other prayer books changed how Armenian faith and culture were communicated. It created a living relation between the faithful and the liturgical life of the church. It also greatly impacted and renewed the spiritual life of the people. During the following two hundred years, the most important works dealing with the history of the Armenian people and the church and several church fathers were printed. The classical Armenian translations of major Greek and Latin church fathers too appeared in printed form. The avant-guards of Armenian printing encouraged other European publishers to produce Armenian books. The theological debate prompted the publication in Rome of a number of theological books and sermons. These books were then used to proselytize Armenians. At the same time, many other books on the Armenian Church, history, culture, language and grammar also appeared. These books aimed at reaching Armenian communities everywhere. The most important of these were: “Grammar and Rational Thinking” (1645) by the Armenologue Gueghemes Galanos, “Zedoutiun Haygapanutian” (1674) by Hovhannes Holov of Constantinople and a book on classical Armenian, “Dictionary for Latin and Armenian” (1695) by Asdouadzadour Nersesovich. Despite political and financial difficulties, Armenian books continued to be published. These treasures of Armenian literary works, academic writings and patristic literature contributed profoundly to our people’s knowledge of their history, church and culture. In other words, they helped the Armenian people to deepen their self-understanding and remain firmly attached to their spiritual, cultural and ethnic roots at a crucial period of their history. Let us now look at the major centres that harnessed the publication of Armenian books as the life-giving sap of the Armenian people. Our most important publication was the “Bible” (1666-1668) by Voskan Yerevantsi in Amsterdam. Also during the years,1668-1675, Voskan Yerevantsi published theological and ecclesiological works, such as Movses Khorenatsi’s “Kirk Ashkharhats” (1668), Vartan Aikegtsi’s “Aghouesakirk” (1688), Arakel Tabrijetsi’s “Kirk Badmoutian” (1699) and “Arhesd Kamaroghoutian” (1675), which was the first book in the Western Armenian language. During this period, the number of copies published per title rose from 500 to 5000, thus making the Bible and Armenian literature available to the wider public. As a result of the efforts of Mekhitar Sepasdatsi and through the sponsorship of many wealthy Armenians, Constantinople, with its large Armenian population, became a major centre for publications. For thirty-five years (1698-1734), the printing house of Krikor Marzounetsi among important books also published the following titles: “Haysmavourk” (1706), “Armenian History” (1709) by Akatankeghos, “Badmoutiun Yerkri Daron” (1719) by Zenob Klag and “Kirk Hartsmants” (1720) by Krikor Datevatsi.In 1699, Asdouadzadour Tbir of Constantinople established his own printing house, and for 50 years he published more than 80 religious titles. He also published the first edition of Naregatsi’s “Book of Lamentations” in 1702. During the 18th Century, more than 20 printing houses were active in Constantinople. Starting in 1727, the Mekhitarist Fathers played a pivotal role in this domain. They published 270 volumes at their printing house on the island of St. Lazarus (Italy). Among these were Mekhitar Sepastatsi’s “Tourn Ashkharhapar Lezoui” (1727), “Parakirk Haygazian Lezoui” (1779) and Ghazar Parbetsi’s “Badmoutiun Hayots” (1793). The printing house of the Mekhitarist Fathers in Vienna (Austria) also published many important titles. In 1772, a printing house was established in Madras (India) by the Shahamirian family. Their publications included: Hagop Shahamirian’s “Nor Dedrak Vor Gotchi Hortorak” (1772) and Shahamir Shahamirian’s “Vorokayt Parats” (1773). They also published the first Armenian Monthly, “Aztarar,” which was edited by Rev. Shemavon Shemavonian. With the publication of Aztarar a new page was opened in the literary life of the Armenian community in India. Several Armenian communities contributed to publishing work. In 1637, the Abbot of Saint Amenaperguitch Monastery in New Julfa (Iran) established a printing house, and in 1638 he published “Saghmosaran”. In 1781, the first printing house in Moscow was established by Krikor Khaltarian, a businessman from New Julfa, under the auspices of the Armenian Prelate in Russia, Rev. Hovsep Arghoutian. In 1823, a year after the establishment of the Nersesian School in Tbilisi (Georgia), Catholicos Nerses Ashdaraketsi of Etchmiadzin established a new printing house there. This printing house became the centre of the Eastern Armenian Renaissance. Over the years and with the expansion and organization of the Armenian Diaspora, many new printing houses were founded in Armenian communities everywhere, and funds to support publications were established. Culture has been a vital dimension of the life and mission of the Armenian Church. Not only did the Armenian Church create the Armenian alphabet, it also supported and supervised the writing of manuscripts and the painting of miniatures. Hence, it was natural that the church also engage actively in the printing work. Publications flourished in the monasteries of Armenia and Cilicia. The printing houses in Etchmiadzin, Sis (later Antelias), Jerusalem and Constantinople continued to provide old and new spiritual, liturgical and literary works to the people. In 1771, Catholicos Simeon of Yerevan, Catholicos of All Armenians, established the first printing press (St. Gregory the Illuminator) on Armenian soil in St. Etchmiadzin. In 1772, “Sposaran Hokevor,” the prayerbook of the Catholicos, was printed. The printing house continued to functionactively in St. Etchmiadzin. The Catholicosate of Cilicia also published important titles in its monasteries and its own printing house. With the Armenian Genocide, the Ottoman Turks not only killed one and a half million Armenians, but also destroyed old manuscripts, books and the printing houses. In 1930, in Antelias (Lebanon), before constructing the Cathedral and the residence of the Catholicos, Sahak Catholicos Khabayan establishd a printing house. Under the leadership of Catholicos Karekin I Hovsepiantz, the Catholicosate published many scholarly books on Armenian studies. Publishing work expanded to other domains of Armenian religious and cultural life and literature and became an integral part of the mission of the Holy See of Cilicia. The printing house of the Armenian Patriarchate of Jerusalem, founded in 1833, started its own publication work in religion, history and literature. Among its publications, it is important to mention “Badmoutiun” by Hohannes Traskhanaguertsi and “History of Tatars” (1870) by Vartan Arevelktsi. The publications work of the Armenian Patriarchate of Constantinople has remained limited because of restrictions imposed by Turkish authorities. Despite all difficulties, the Holy See of Cilicia has guarded the essential role of publications as part of its vocation. By encouraging new authors and researchers, the Catholicosate reaches out to the members of Armenian communities everywhere. 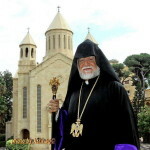 Only through the written Armenian word will the language created by St. Mesrob Mashdotz strengthen the faith of the Armenian believer, enrich the spirituality of our church, shape the vision of the people and build community by communicating our spiritual, moral and national values and ideals and by building relations. With this firm expectation, the Holy See of Cilicia continues, with new impetus, to publish books. By reading Armenian books, our people will discover our history of struggle and survival, guard our historical memories and traditions and discover our spiritual and cultural treasures. In spite of major advances in the area of audio-visual and communication technology, we believe that the printed book has a special place and role in education, in the promotion of our cultural and spiritual values and traditions, as well as in our church’s missionary outreach and community building. It is with this conviction that new publication funds have been established by benefactors under the auspices of our Holy See of Cilicia. Along with these continuing efforts, over the past few years, we have observed a new phenomenon. It became clear to us that our people are reading fewer books. In 2004, in our message during the opening of the book fair, which our Catholicosate organizes every October, we said, “it is with regret that we observe the marginalization of the Armenian book in Armenia and the Diaspora. New value systems are guiding the life of our people; new priorities are dominating our life. We are most concerned that our clergy, our academics, teachers and our students remain indifferent towards the book”. On this occasion of the 500th Anniversary of Armenian printed books, we want to express our great appreciation to publishers and donors who continue to support the Armenian book. We call upon our people and particularly to youth, students and teachers not to become drowned in the new technologies that make reading easy and give quick and superficial information. We want us to recover and rediscover the true vocation of the Armenian book. We would like to see the Armenian book become the friend of Armenians of all age groups and to inspire our people in their quest for a spiritually-sustained and vision-oriented life. 1. Armenian academics and writers be invited to produce works of quality and vision that may enable our people to enrich their lives with spiritual, moral, cultural and national values, tradition and ideals. 2. Armenian benefactors be encouraged to sponsor the publication of specific works or create earmarked funds to support publication projects. 3. Armenian families be encouraged to build their own libraries at home and read and discuss Armenian books as an integral part of family life and activities. 4. Armenian publishers be supported in their endeavors and helped to ensure reasonable prices for books to make them available to the wider public. 5. Libraries be created in schools and community centres in order to enrich the interaction between the Armenian book and our youth and children. The book is a rich source of knowledge; and knowledge generates faith and faithfulness, responsibility and commitment; it enhances self-understanding and promotes mutual respect and understanding. It is our wish that through these efforts and other ways that you may think of, we shall re-establish the centrality and vital importance of the book in the life of the Armenian Church and Nation. We also hope that through our commitment to the Armenian published works, we shall strengthen our national identity and deepen and broaden the dialogue with our neighbours in different environments in which we live. We pray that the grace and blessings of the Almighty God may strengthen spiritually our people in Armenia and in the Diaspora.